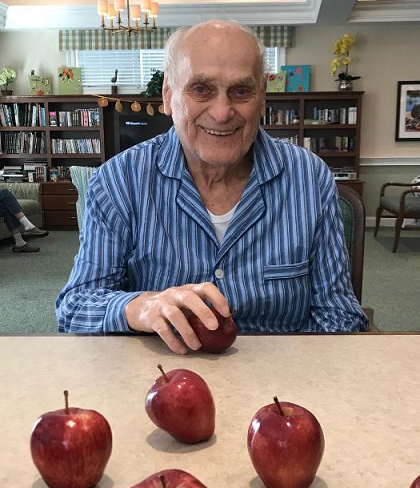 Recently, residents at The Saybrook at Haddam’s Safe Harbor Memory Care neighborhood celebrated the start of the fall season with a game of “bowling with apples.” Residents had a lot of fun playing this silly tabletop game – and everyone laughed as we challenged our dexterity, concentration, and motor skills to try to roll apples. When the game was done, our chef gathered and washed the apples then baked them with a little cinnamon. Nothing smells like autumn more than cooked apples! This is just one example of how we develop activities and entertainment that embrace each season, get everyone involved, and add to the quality of everyday life for senior citizens and their families. Keeping a careful eye on the attitude and aptitude of each resident, we fill our days in ways that make the most of each moment. We love to travel to local destinations, host local entertainers, and tackle as many games and activities as we can handle. Family and friends are always invited to join us, of course, which makes each event even more special and memorable. Throughout the rest of the autumn season, we have planned outdoor picnics, “leaf peeping” joy rides, special seasonal meals, and other fall-related activities. One of our favorites is painting pumpkins (and gourds), trick-or-treating and costume parades with young family members, and lots of music and entertainment. It is very hard to be bored or feel lonely at The Saybrook at Haddam! nd pine cones, then glue them together to make a “sculpture” or centerpiece. Or, place items in a glass jar then wrap with raffia or burlap ribbon. Add some dried flowers or plants for extra flair. If you choose to include cattails or milkweed pods, spray first with a fixative so they don’t shed. Try some “old-fashioned” flower pressing — Pick some late-summer/early-spring foliage and flowers, place between wax paper, and insert into large books. When they are properly dried, place into a picture frame, add to a decoupage project (such as a bird house or jar), or glue onto nice card stock for custom notecards. Take a fall trip – Drive your grandparents to a local orchard for apple picking, find a pumpkin and gourd patch to walk through, or visit an arboretum or garden center. Look for places with hay rides, apple cider (or, better yet, cider donuts), places to walk pets, and perhaps a hay bale or two to take a rest. Host a themed party – From football to Halloween to Thanksgiving, there are many days and reasons to host a fun party. Keep your senior-citizen-aged friends in mind when setting the time (early to late afternoon is best) and menu (mix in softer foods and less-spicy options), and entertainment (not too loud or agitating). Quality of life for seniors includes lots of socializing and participation. We hope these ideas inspire new ways families can include senior citizens into their enjoyment and celebration of this much-favored season! Of course, don’t forget those baked apples!